Like a good cupcake fan, I DVR'd the Martha Stewart show during cupcake week at the beginning of April. 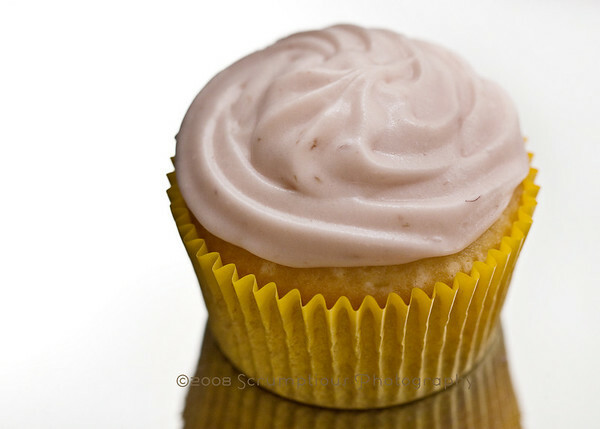 One cupcake in particular caught my eye: the Meyer Lemon Raspberry cupcakes from Vanilla Bakeshop. I love the combination of lemon and raspberry, so I knew I would have to give these puppies a try. The cakes were vanilla, not as moist or sweet as Billy's recipe, but pretty good. 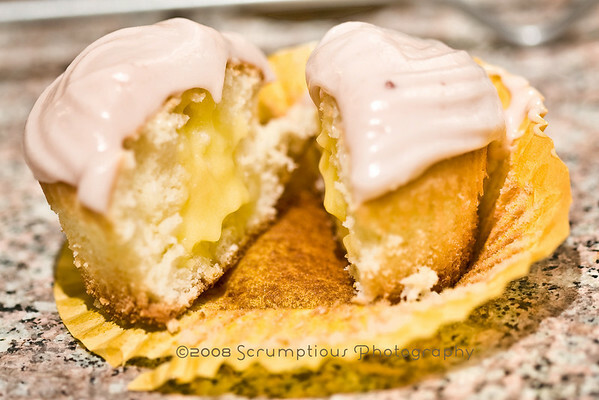 But the best part of the recipe, in my opinion, is the lemon curd filling. This stuff was DELICIOUS. And I almost didn't make it, because 1) I didn't have any Meyer Lemons and 2) I didn't have much time. I went out and found a jar of lemon curd at the grocery store, but it looked kind of gross, so I just threw up my hands and gave in to making the (non-Meyer) lemon curd. As for the raspberries, it turns out that they weren't really part of the cupcake at all! There is just one raspberry sitting on top. Looks pretty, but certainly wouldn't do for my voracious raspberry appetite ;) So I sought out a raspberry cream cheese icing recipe to replace the vanilla bean. It ended up being just OK. The extra moisture in the preserves just pushed it over the too-wet point in my kitchen. I added some extra cream cheese, which helped a bit, but it was already super-sweet so I didn't add any more sugar. I think next time I will try Tartelette's cream cheese buttercream recipe with some added jam, since the meringue buttercreams seem to work better for me. Yields 24 cupcakes (I got 28). Their measurements are ridiculous, so I've just put grams for some of the items. In the bowl of an electric mixer fitted with the paddle attachment, beat butter and sugar together until light and fluffy. Add vanilla; beat to combine. Add egg yolks, one at a time, beating well after each addition. 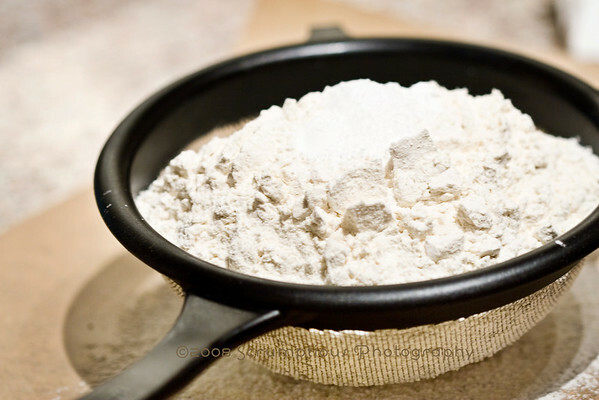 Sift together both flours, baking powder, and salt into a large bowl. With the mixer on low, add flour mixture; mix until well combined. Add sour cream; mix until well combined. 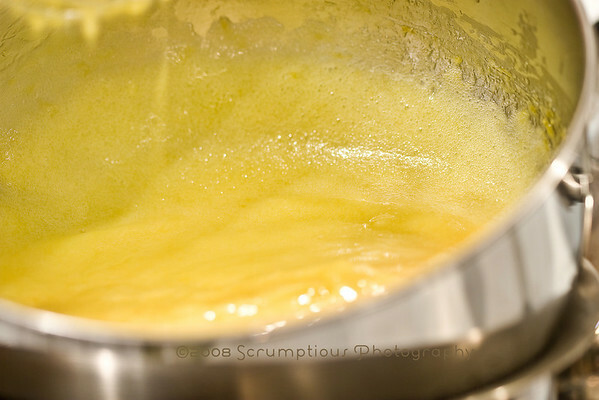 In a clean bowl of an electric mixer fitted with the whisk attachment, beat egg whites until stiff peaks form. Gently fold egg whites into batter. 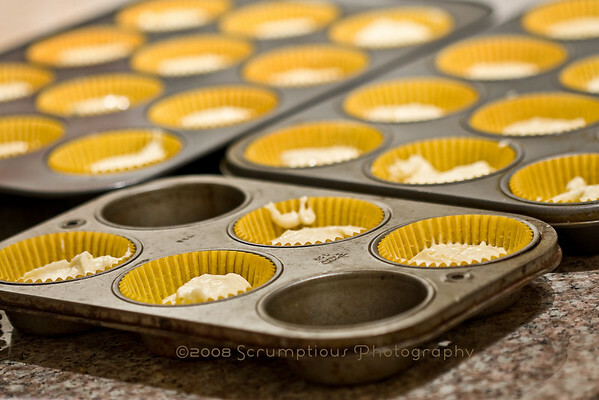 Fill each muffin cup half full with batter (I used a #16 disher and had enough for 4 extra). 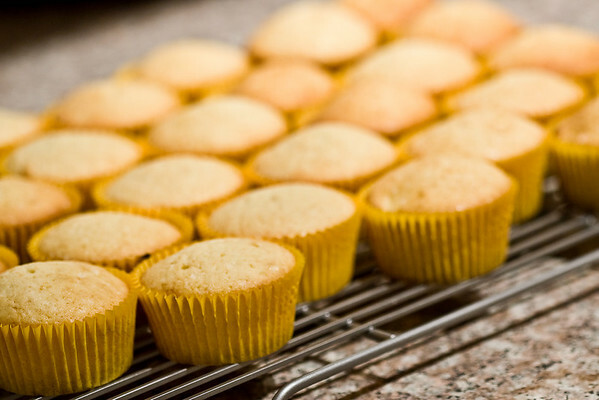 Transfer muffin tins to oven and bake until a skewer inserted into the center of one of the cupcakes comes out clean, 20 to 24 minutes. Let cupcakes cool completely. This was originally written using Meyer lemons, but I used regular lemons and thought it was delicious. If you want this to be sweeter, try substituting a little orange juice for part of the lemon juice. Also, I had a ton left over (which I secretly ate by the spoonful afterwards). Prepare an ice-water bath. Set a medium bowl in the ice-water bath and set aside. Place the sugar and lemon zest together in a bowl and rub them together with your fingers until the sugar is moist (the original recipe suggested using a mortar and pestle here, if you have it). 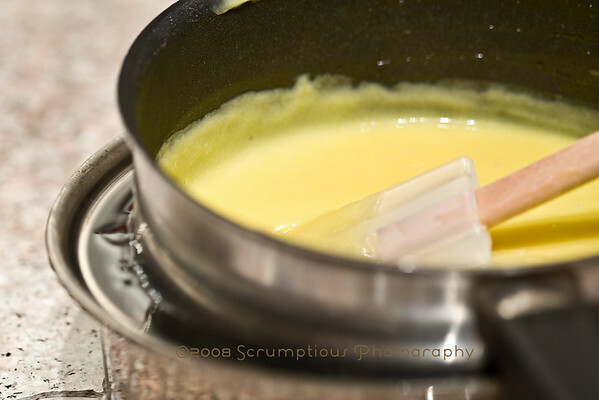 Transfer the sugar mixture to a medium heatproof bowl along with the eggs and egg yolks; whisk to combine. Place the bowl over a saucepan of simmering water and whisk constantly until the sugar has dissolved. Add the lemon juice and continue whisking until the mixture is thick and reaches 160 degrees Fahrenheit on an instant-read thermometer, scraping down sides of bowl as necessary. Add in the butter and whisk until well combined. Strain lemon mixture through a fine mesh sieve set over prepared bowl (I used a strainer covered in cheesecloth). 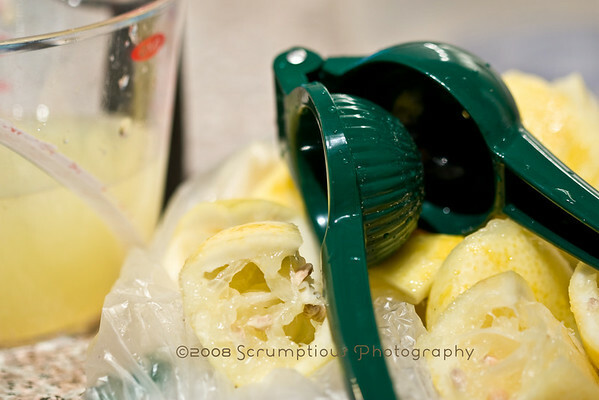 Cover with plastic wrap, pressing the plastic wrap directly onto surface of the lemon curd. Transfer to the refrigerator until completely chilled. It should keep up to 2 weeks in the fridge. As I said earlier, it was quite runny. Next time I would probably add some meringue powder to stabilize it, or use cream cheese buttercream as a base. Beat preserves, butter and cream cheese together until smooth. Gradually add in the sugar and beat until fluffy. Add in the food coloring and mix until the color is even. 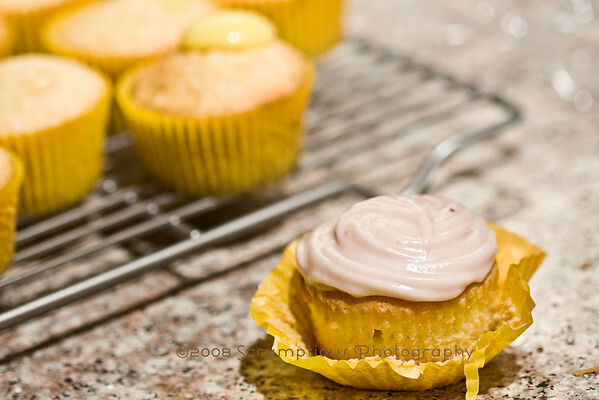 There are several ways to go about filling the cupcakes with the lemon curd. I had just bought a Wilton "cupcake filling" tip, so obviously I used that, which was pretty fun once I got the hang of it. There is also chockylit's cone method, and the method used by Vanilla Bakeshop in this recipe, which calls for using an apple corer to take a chunk out of the cake and filling it in with a squeeze bottle filled with lemon curd. Whatever works! Once the cakes are full of curd, go crazy with the icing. I used a Wilton 1M tip to pipe it on, but it didn't actually matter since it all turned to goo anyway. Stupid building-controlled heat. I feel like screaming out loud.AAAAHHHHHHHHHHH!!!!!!! I wish I could bite into one of these now!!! Most probably there will be nothing left by now! These looks to die for!!! I can verify - these are the best non-chocolate cupcakes I've ever had. I really do sometimes still have dreams about them. Also, the smoke detector contraption is pretty darn ingenious. this has made me a total believer........I'm so glad I happened to click your blog link!!!!! This is amaaaaaaazing!!! I'm going to do a whole post about your blog and these awesome cupcakes once I try it out. Thanks!!! I just happened across your site and I love it. As an amateur cook and amateur photographer I'm completely in love with your food and photos. I love the recipes, but do you ever think you'll post anything about how you take your great pictures of your delicious food? I, for one, would love to know. Can't wait for more! @annie, i also dream about them from time to time ;) i had to eventually throw away the extra lemon curd... i kept eating it. I REALLY wish you had listed some of the special items that'd be needed along-side the list of ingredients...Although it is mostly my own fault for not *thoroughly* reading through the entire page before buying everything and starting. Either way, cheesecloth and a candy thermometer isn't something a 20 year old student would keep in their tiny apartment kitchen on any given day. I searched all of my local grocers for this 'vanilla bean paste' without luck. I ended up substituting with vanilla extract, because I can't afford to pay 12 dollars for a vanilla bean as a working student on a budget. Honestly, the average-Joe doesn't have a palate discerning enough to notice the difference between the two, nor would anyone be impressed by me wasting the time and money purchasing one to slit it open and scrape seeds from. Kudos to those of you who have the money and are willing to put forth the extra effort, but that's just not for me. I would have started the recipe instructions with the lemon curd first, because as you stated, it does take quite a while to prepare and needs plenty of time to thicken and cool in the fridge. 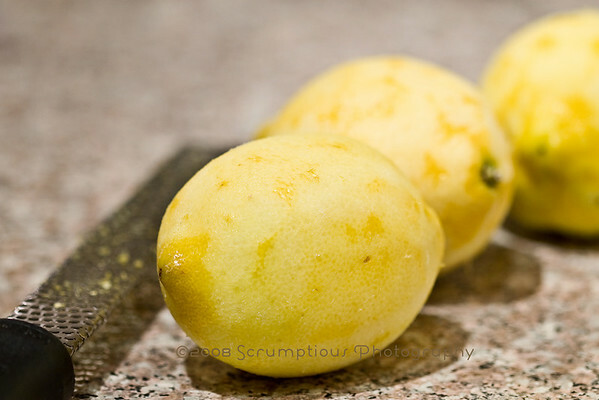 Thankfully, I did not need to strain mine, as I've found that delaying adding the lemon juice reduces clumping drastically. The ice water bath seemed unnecessary, and as such, I skipped it. For those of you without a fancy Kitchenaid bowl mixer, I suggest throwing the butter in the microwave for softening prior to adding the sugar when it comes to the cupcakes. Using my electric beater would have been impossible with chilled or room temperature butter. The batter came out thicker than I would have liked for cupcakes, and as such the cupcakes have a heavier texture, but hopefully the curd filling will help dispel that some. I quite honestly have no idea how you kept your frosting color so light, unless you somehow came across a jar of nearly-clear raspberry preserve. It is indeed very runny. I've decided to go with a different frosting recipe to top my cupcakes.